Most of us will agree - dogs are awesome. They are loyal, fun and loving. And that's exactly what Troja, an Irish Setter with a passion for treats and adventures, is. 4 years ago George from Norway, the owner of Troja, started taking pictures during hikes using his phone. "At first, it was mostly macro photos of plants, insects and so on," George told Bored Panda. 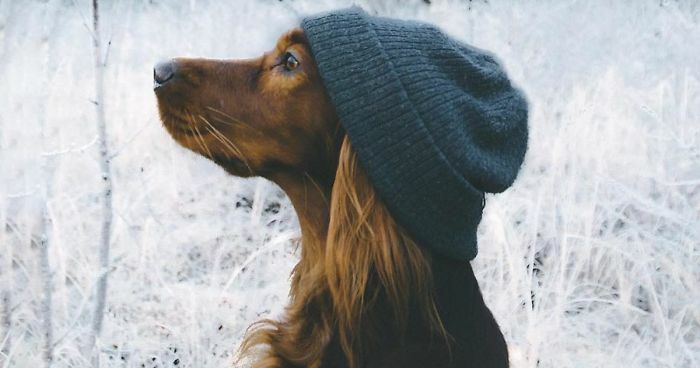 "Troja was always with me on the hikes, but I never had the idea of taking photos of her until people I met during my hikes who complimented her looks. So after that I gave it a try and I enjoyed taking photos of her because it created more interaction between her and me during our hikes." In November of 2014, George set up an account on Instagram to share the adventures of Troja. Now the account has close to 100k followers and loyal fans who inspire the photographer. "My inspiration comes from the comments and private messages I get from people who tell me they have been inspired to bond more with their dogs and to be more active with them," George shared. "The best thing about having this account is the interaction I can have with so many different types of people who also share the same passion for the outdoors and dogs." When asked if Troja has any quirks, George said: "I think most dogs have their own fun little quirks, Troja does as well, but not any significant ones other than that she puts her paw on your shoulder if she wants attention!" We invite you to spend some time and explore the undiscovered trails in the Norwegian Wilderness together with George and Troja. Irish setters have the most spectacular red fur!!! Who throw that snowball ?? Bring your face over here! Ha-ha - Norwegian version of "fetch"
Should be used for a shampoo ad! I said "meat" human, carrots are for rabbits. Can you hurry this up, my delicate nether region is freezing solid here! What a wonderful picture, it feels like I can see into the pups beautiful soul. There is no bad weather, there are only improper clothes. "Are you making fun of me?" This is how you attack a stick! I got all wet looking for you. What do you mean you forgot to bring snacks? Why am I the one always standing in the lake, river, snow, mud? Huh? Why? We need to renegotiate my contract. This needs to be in a dog shampoo commercial. There is such a thing as dog shampoo, right? Still wind .... with this damn wind it seems that I never brush! I have posed enough for you, human. We are done now. Oh yea! What till they find that present I left! "OK, I ready. Toss cookie now?" why do dogs tongues always look like rose petals? Ok .... if I give you the paw, you give me a biscuit? Can we PLEASE go to the dog park now? That hair on the top! I heard a noise. You hear a noise? I swear, I heard a noise! Me and my husband: Me: Can't I please just get some water without you taking a picture?????? Looks like a winter wonderland. Oh man...that hike was loooong! Can't a guy get any privacy around here? Two minutes, please. That's all I ask. Trees, trees everywhere and not a stick to fetch. Her tongue looks like a rose petal, and a perfect match to her fur. Friend, it's windy here ... too much wind! That face! I'm in love! What was that sound? What did I hear? What is it?? It's snowing, dude! I want to go home! OK, seriously, are we waiting for a blizzard or something? The photoshoot's over you maniac human! Take me home!